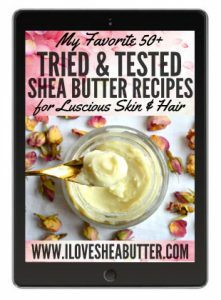 DIY Shea Butter Hair Mask for Hair Growth - beautymunsta - free natural beauty hacks and more! 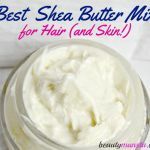 Make this DIY shea butter hair mask for hair growth! If you’re a naturalista, then you must be using shea butter as a sealant to keep your beautiful curls moisturized. 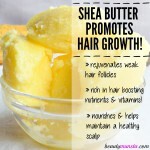 You might have wondered if shea butter, which is intensely moisturizing and nourishing also helps promote hair growth. I’m here to tell you that yes it can! Shea butter is LOADED with vitamins and nourishing nutrients that feed the hair follicles with goodness, strengthening them thereby stimulating hair growth. 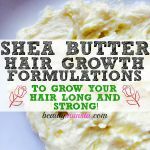 Another way shea butter helps hair growth is by acting as an excellent emollient and sealant. It traps moisture in the scalp thereby maintaining a healthy and moisturized scalp. Did you know that dry scalps prevent hair growth and actually lead to hair fall?! If you have a dry scalp, you must use shea butter as a sealant to lock moisture and prevent hair fall. 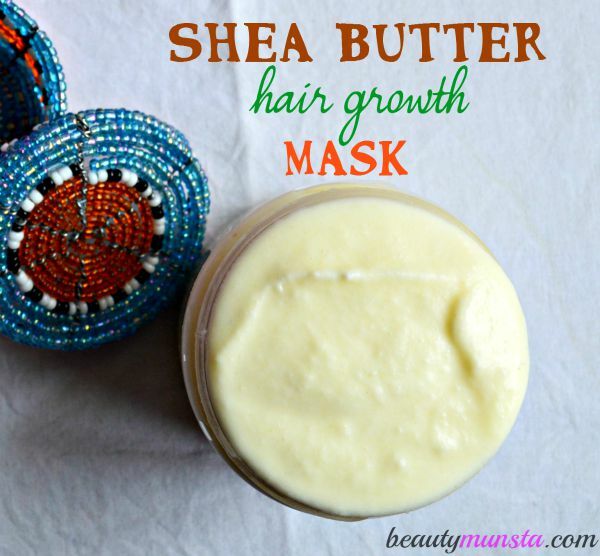 Here’s a DIY shea butter hair mask that boosts hair growth and prevents hair fall! It’s also a great treatment to heal itchy and inflamed scalps as it contains the cooling and soothing eucalyptus essential oil, which by the way, is great for hair loss problems as you can read about in this post. Slather this cooling and nourishing mask to treat hair loss and promote hair growth! It contains eucalyptus and rosemary which are two powerful hair growth stimulators! ➝ Coconut Oil – It’s been used as a hair growth boosting oil since ages ago in India and it also leaves your hair soft and shiny. Read 10 Beauty Benefits of Coconut Oil for the Scalp and Hair. ➝ Sweet Almond Oil – Great for treating split ends and damaged hair, sweet almond oil has also got hair growth stimulating properties. ➝ Jamaican Black Castor Oil – A gem for natural hair, this oil boosts hair growth instantly and also helps treat itchy and irritated scalps. ➝ Rosemary Essential Oil – Improves blood circulation in the scalp hence promoting hair growth. Read more about rosemary essential oil for hair growth in my post “How to Use Rosemary Essential Oil for Hair Growth”. ➝ Eucalyptus Essential Oil – Is effective when it comes to preventing hair loss and promoting new hair growth. Read more about it here. 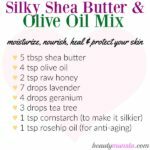 Work with soft shea butter. If yours is hard, soften it by placing the jar in a bowl of hot water or using a double boiler. Once softening, add the coconut oil, castor oil and sweet almond oil and mix them well using a whisk or strong spoon for about 3 to 5 minutes. Add the essential oils and mix again till fully incorporated. 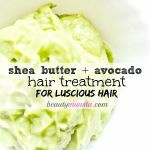 Your diy shea butter hair mask is ready! Store the sweet smelling goodness in a clean container. It keeps for more than 2 months. Make sure not to get any water into it and use a spoon to scoop it out. Apply liberally all over your scalp. Gently massage it in using your finger tips. Leave it to penetrate for about 30 minutes or more. You can cover your head with a shower cap or baggie. Use the hooded dryer method if you want. When the time is up, rinse off it off using warm water and a sulfate-free shampoo. You can use this amazing Maple Holistics Sage Shampoo containing algae extract. Remember with sulfate-free shampoos, there is no lather like the regular shampoos. You just have to squeeze out a little of the muddy looking mixture and rub it all over your scalp and tresses, then rinse out using tepid or lukewarm water.